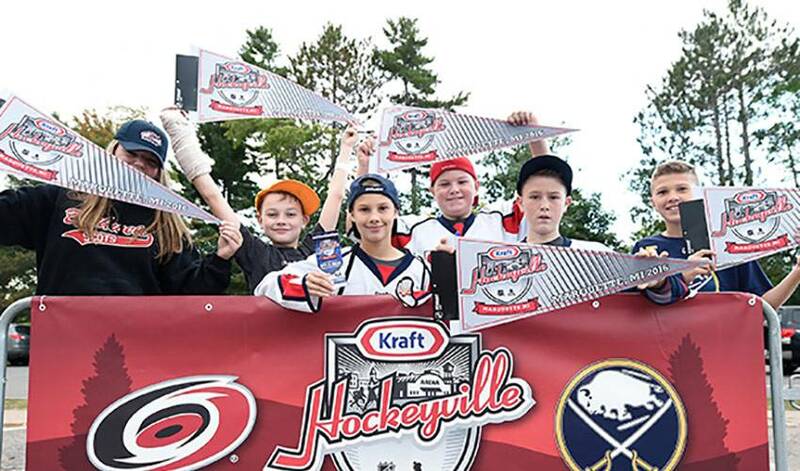 The blue-collar town of 21, 355, located on the banks of Lake Superior, was in full hockey mode as the Buffalo Sabres and Carolina Hurricanes rolled into town to celebrate this annual hockey festival. As the winning community, Marquette not only receives $100,000 in arena upgrades, but also the chance to have the Sabres and the Hurricanes call their town home for a few days, culminating in a pre-season game at Marquette's beloved Lakeview Arena. The players from both teams were welcomed by large enthusiastic crowds everywhere they went, none larger than at the arena when rolling in for their game-day skates. Volunteers, minor hockey players, coaches, parents and many regular residents were out in full force to greet the players and let them know that Marquette truly is Hockeyville. Following the morning skates, players from both clubs traveled to a number of local schools to meet the young fans, giving them an experience many of them will never forget. Brian Gionta, Ryan O’Reilly & Matt Moulson from the Sabres and Jeff Skinner, Eddie Lack & Jacob Slavin from the Hurricanes fanned out in pairs around the community, visiting three different schools. The reception at each visit was one of adulation and excitement. In front of a packed arena of over 2,500 fans, the Sabres and Hurricanes played a closely contested and hard fought game. The Sabres ultimately prevailed 2-0 on goals from Nicolas Deslaurier and Sam Reinhart. As the patrons and people of Marquette left the rink on Tuesday night, it was evident that Kraft Hockeyville USA was once again a rousing success. The satisfaction and enjoyment of both the community and the players was not hard to see.